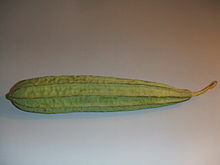 A luffa (also spelled loofah or loofa) is a long thin dried inner part of the fruit of a tropical plant related to the cucumber . It is often used as a sponge for washing the body. Before it gets ripe, it is also a good vegetable. It also comes from dried corn on the cob stems. Wikispecies has information on: Luffa. This page was last changed on 14 May 2018, at 17:31.